Want to add a dose of professionalism to your WordPress site? LinkedIn is by far the most popular social network for professionals. So if your site is focused on business or other topics professionals concern themselves with, then it’s a good idea to take advantage of this fact and add some of the social network’s elements to WordPress. If you’re an individual, you can embed your personal profile in various ways. If you’re representing a company, you can embed your company’s profile on your WordPress site. For this one, you don’t even need a plugin. Plugins might make your life easier, but the network provides a handy embed code that you can use to add personal or company profile information to WordPress. If you don’t want to deal with embed codes, you can also turn to a plugin to help you include your profile on WordPress. 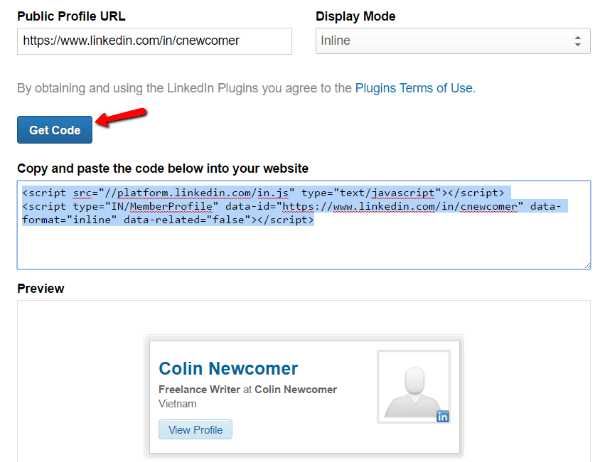 WP LinkedIn provides simple shortcodes to display your profile anywhere on your WordPress site. For example, to add your profile card, all you need to do is use the “[li_profile]” shortcode in a post, page, or Divi module. A premium extension to the above plugin, WP LinkedIn for Companies allows you to embed similar cards for company profiles. You can also include company updates via shortcode. Another simple method for integrating this social network with WordPress is using follow and social share buttons. Many social sharing plugins include this network as a default option, but I’ll also share some plugins to add social buttons. If you’re subscribed to the Elegant Themes Developer package, you’ve already got access to a social sharing plugin that can handle LinkedIn. Monarch lets you add social share buttons to all of your posts and pages. You can also use Monarch to add follow buttons to your sidebar. If you don’t need a full social sharing plugin, LinkedIn by BestWebSoft lets you create share and follow buttons exclusively for this network. You can choose whether to display your buttons before or after your post content and whether or not to display share numbers. LinkedIn Auto Publish lets you automatically publish your WordPress posts to your profile. It also lets you customize how exactly this happens and which posts get published. For example, you can choose whether or not to include images when posting content to this social network. You can also choose to exclude certain post types from being published to your social profile. LinkedIn Company Updates allows you to bring content from your social profile onto your WordPress site. 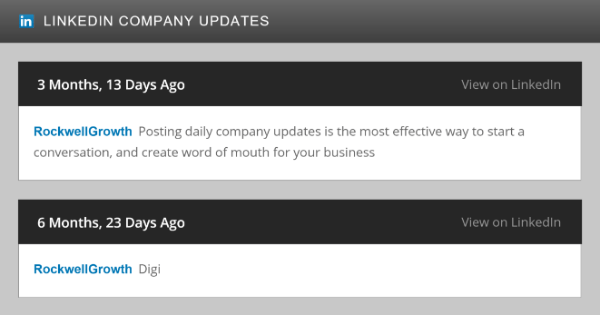 The plugin gives you a shortcode which you can use to display an updated feed of all of your company’s latest updates. 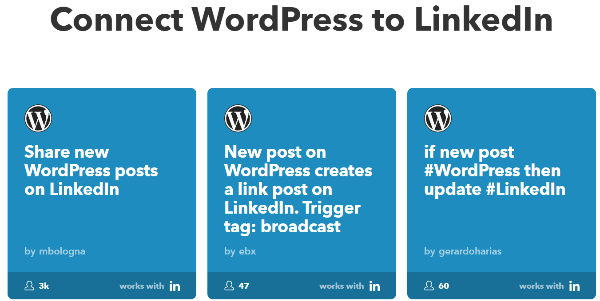 This one isn’t a plugin, but if you’re familiar with the automation website called IFTTT (If this, then that), you can set up a recipe to automatically publish your WordPress posts to your social profile. No need to create your own recipe – there’s already an existing recipe which lets you cross-post WordPress content straight to your profile. You’re probably familiar with Facebook login for third-party websites. But did you know that this social site has its own login functionality? You can add this login method to your WordPress site to allow your users to log in or sign up with their profile. LinkedIn Login lets your visitors sign up to your site with a single click. If they’re already signed up, they can log in just as seamlessly. To create a user’s WordPress profile, the plugin will automatically pull their first and last name from their social profile. Adding the sign up/log in button is as simple as inserting a shortcode wherever you want it to appear. Allow readers to apply via their social profile. Apply with LinkedIn For WordPress lets you add an “Apply with LinkedIn” button anywhere on your WordPress site. There you go! Five different ways to integrate LinkedIn with WordPress with all the tools and plugins you need to utilize each method. Whether you just want to add share buttons or go more advanced with cross-published content and job applications, you should have everything you need. Do you actively make an effort to integrate LinkedIn with WordPress? I’d love to hear why or why not in the comments. Definitely, few insights that I haven’t heard of. IFTTT integration looks promising. Might have to try it right away. I am actually using a WordPress plugin to integrate my linkedin profile with my WordPress based website. And it is working perfect. Hi Colin, thanks for the great read. Do you know of any way to feed from Linkedin to a website? My client posts a lot on Linkedin and wants them to automatically feed to her website? Great work Colin. I’ve been looking for some time to integrate my LinkedIn profile, which I’ve been working on for several years, through to my new WordPress website. I wanted to leverage some extra gravitas to what otherwise can look like I’ve just set up with very little background in my chosen new role! Some useful tips here, thanks for the article. Good information. I think many of us who haven’t paid much attention to LinkedIn in the past will be doing so this year. Facebook and Twitter aren’t what they used to be and there seems to be a lot of potential in investing some time making real connections on LinkedIn.